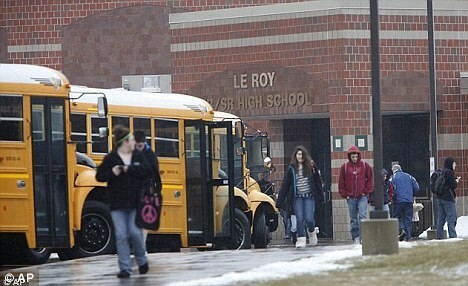 A bizarre illness that has affected 18 students at a high school in America is causing confusion among experts.The girls at Le Roy High School are suffering from a bizarre illness that has the girls exhibiting uncontrollable Tourette’s-like, tics, gestures, and seizures. Experts at first thought the tics were a form of mass hysteria but now a neurologist suggests it could be casued by PANDAS, not the cuddly animal but rather an acronymn for – pediatric autoimmune neuropsychiatric disorders associated with streptococcal infections. PANDAS is used to describe a subset of children who have obsessive compulsive disorder (OCD) and/or tic disorders like Tourette’s and whose symptoms develop after infection with strep. This new diagnosis was made by Dr. Rosario Trifiletti. The initial diagnosis of the majority of the afflicted students was that individually, they suffered from conversion disorder, and collectively, they suffered from mass psychogenic illness. Conversion disorder occurs when someone develops neurologic symptoms, such as involuntary movements and sounds — “tics” — that have no known physical cause. Conversion disorder is believed to be the physical manifestation of psychological stress. “People who are vulnerable to this are usually highly smart, vulnerable to suggestion and very sensitive.” Says said Dr. John T. Walkup, a child and adolescent psychiatrist and chairman of the Medical Advisory Board of the Tourette Syndrome Association. Symptoms in these cases are not fake but are believed to be produced by the brain’s subconscious. When conversion disorder occurs in a group of people, typically from a close-knit community, the diagnosis for the group is mass hysteria or mass psychogenic illness. Mass psychogenic illness is the preferred medical term because of the negative connotations associated with mass hysteria. Mass psychogenic illness is far more common in females than males. A third theory is that the strange illness has been caused by a chemical spill. Below is a report on this strange phenomenon. This is a great article. Thanks for sharing such wonderful information.